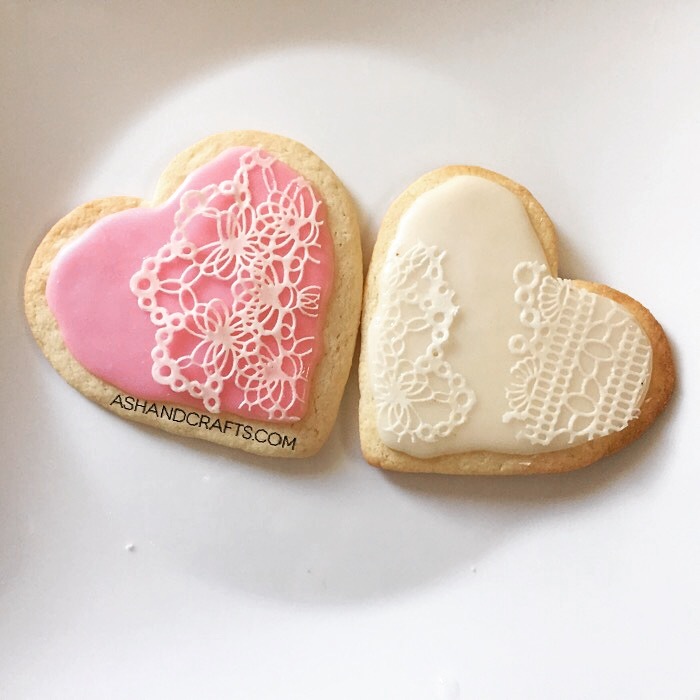 Valentine’s Day has come and gone, but I made these lace cookies anyway because lace is just too pretty to resist. If you haven’t seen my tutorial on icing your cookies, please click here. I made the lace with Sugar Veil and a silicone lace mat. First, ice the cookies and let them dry. While they are drying, prepare the Sugar Veil by mixing 2/3 c. Sugar Veil with 1/3 c. water. Mix until smooth. Then pour just a bit onto your silicone mat and begin spreading it all over the mat. Instead of buying their scraper, I just used a cake frosting smoother I already had. Once you’ve scraped the mat and the Sugar Veil is in all the crevices, make sure to do one last swipe using a cleaned scraper to make sure there isn’t any Sugar Veil where it shouldn’t be (Like the holes of the lace). Bake in the oven at 200º F for about 2-5 minutes, depending on your mat/design. You’ll know when it is ready when it easily separates from the mat and does not stick to your finger when touched. The lace should feel kind of like stretchy plastic. If you over-bake the design, it will be brittle and break easily. I put the lace on top of the iced cookie and trimmed the edges. Finally, I just wet the cookie with a bit of water where I wanted to place the lace and it will stick. Here are the links to where I purchased my items. Please note they are Amazon affiliate links. If you purcahse through my link, I get a small referral commission. It does not affect the price you pay. If you have any questions, please feel free to ask me. Although my guide was very word-y, it is actually very quick and easy to do! This decoration idea is adorable! Thanks for sharing. I should try it out this Easter.